Package Content : 30 soft contact lenses in sterile buffered saline solution. 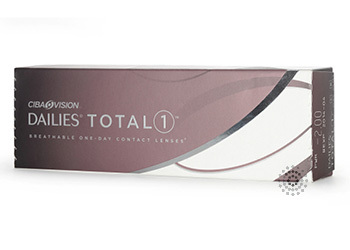 Dailies® Total 1® Water Gradient Silicone Hydrogel (SiHiy) contact lenses, manufactured by Alcon and offered in a 30 pack format, represent a new era of comfort. They are the first water gradient silicone hydrogel daily disposable contact lenses featuring an increase from 33% to over 80% water content from core to surface. This innovative contact lens has the highest surface lubricity and highest breathability (or oxygen transmissibility) of any leading daily disposable contact lenses, delivering exceptional comfort that lasts through to the end of the day. Be sure to follow your eye doctor’s recommended replacement schedule.